Yes, chicken can be beautiful. Hamburgers can be gorgeous. A pub can be extraordinarily lovely. If you add flowers, of course. 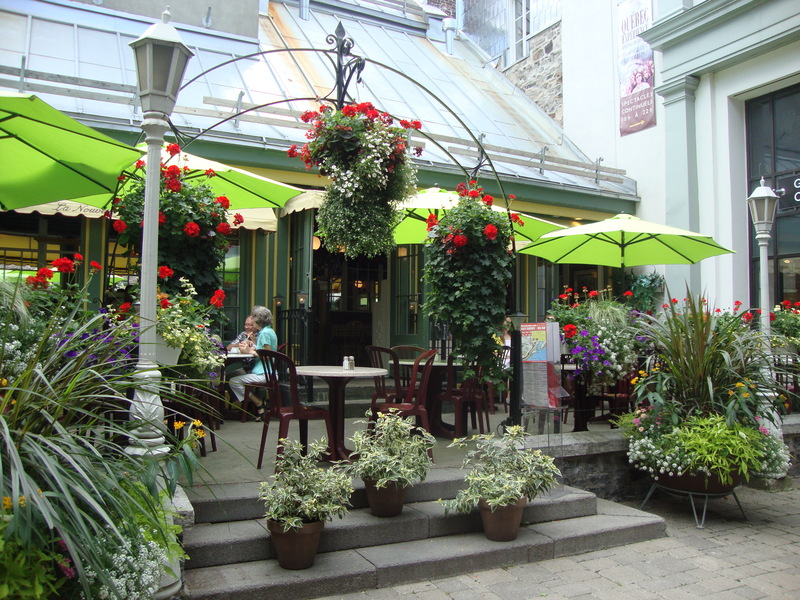 Travelling in Quebec this month, I saw some colourful gardens full of annuals–allysum, geraniums, salvia and more. They were clearly well planned and well-tended even in mid-summer. I was impressed, but I was even more surprised by where I found them: outside restaurants. 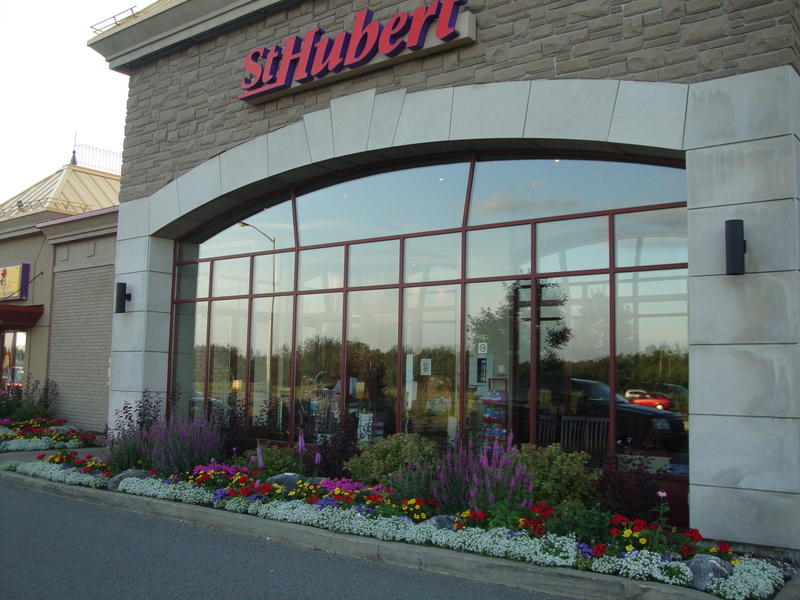 I am sorry that St. Hubert restuarants are no longer in Ontario–especially if they all look like this one! It would have come at no small cost–just look at how the beds are stuffed to overflowing with all kinds of plants. I can’t imagine how many flats that would have been–a dozen? Six dozen? More? One of the other big surprises was at a huge highway service centre. It was brand new, with not just a gas station but Tim Hortons, A & W, and Taco Bell. We stopped to eat–feeling not only hungry but a little saddle sore in the middle of an 8-hour drive–and I almost gasped out loud. 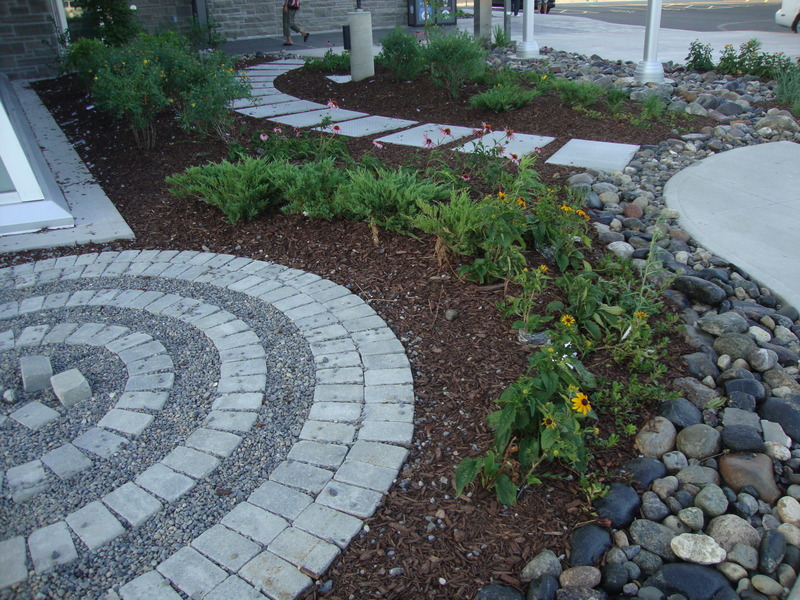 This complex boasted more than a simple garden–here was a lovely design of hard as well as soft landscaping. I loved the stone circles and the pathway leading up to the door. 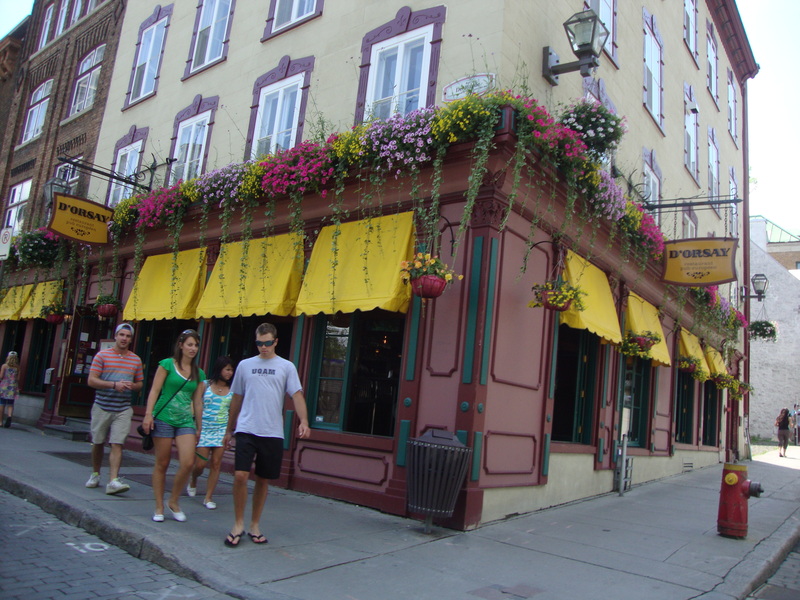 Walking along in downtown Quebec City we passed a few more restaurants that had gone to great lengths to look beautiful. These weren’t exactly burger joints, but they didn’t have much to work with, either–there was very little space and no built in planters or lawns. I wonder how much work it takes to water these potted gardens. Some of them are small enough that they would need to be watered every day, and they must need a tall ladder to reach them, too. In the middle of running a busy resturant, it must be hard to find the time. I wonder if they hire a company to do that for them? Does the owner do it? Do they send the chef outside in his big white hat? I commend those who were the dreamers and decision makers for these businesses. They have created beauty in places where we don’t expect to find it. What could have been barren spaces have become green and lush, with patterns and textures that are delightful and pleasing. I can’t say whether such an investment will result in greater profits, but I do think that giving customers a pretty walkway might just put them in a happier or even hungrier state of mind. Giving them something nice to look at out the window while they eat could make them relax enough to stay for dessert. And if nothing else, a well cared-for property sends a message that here is a business that is successful, cares for the environment, and is attentive to details. I can’t speak for anyone else, but it makes me want to eat out more often, even if it’s only hamburgers. This entry was posted in Uncategorized and tagged flowers, food, landscaping, Quebec. Bookmark the permalink. I love the flowers in the last photo you took. I’ve never seen anything like that before. Very pretty!